Looking for an awesome 60 second Atlantis overview? 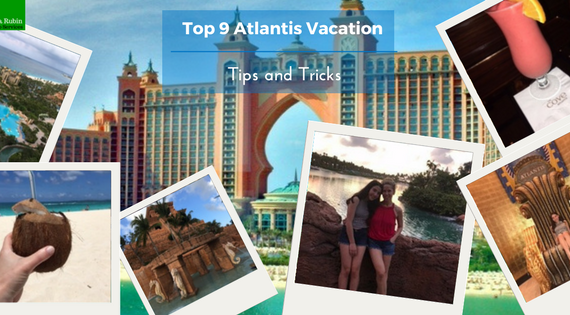 Watch our quick Go Pro Video from our latest Atlantis trip! On my quest to seek out adventure in the Bahamas I stumbled upon an excursion that looked and sounded awesome. 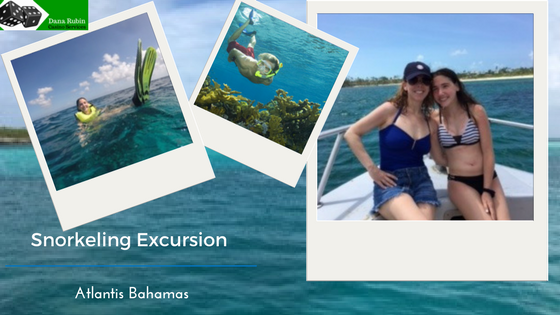 Seahorse Sailing Adventures advertised their Sunset Dinner Cruise as the “only Dinner Cruise on Nassau, Paradise Island, Bahamas and a truly unique experience”. Perfect! Dinner and a boat ride at sunset – I was sold. I was looking for something unique outside the resort and boy, did this deliver! I was not sure what to expect but got lucky that space was available so I booked my daughter and I on the Wednesday night cruise. I was happy with the affordable price – $70 per adult and $30 per child. The dinner cruise is offered ONLY on Wednesdays and Saturdays 5 pm to 7 pm (standard time) and 6 pm to 8 pm (daylight savings time). The cruise leaves from the Paradise Island Ferry Terminal (across the street from the Atlantis). At 5:30 pm we walked over to the dock, checked in and boarded the gorgeous catamaran boat. As I always find in the Bahamas, the majority of Islanders are truly kind and appreciate tourism. The crew was enthusiastic and helpful as we boarded the boat. I saw some small children but the majority of guests were couples and adults. My 15 year old daughter was completely comfortable with the crowd and we were ready to go! Bar is open! One Bahama Mama (or fruit juice) and a traditional Bahamian dinner buffet was included with our ticket. We settled in with our drinks on the huge bow of the boat and cruised along the beautiful Nassau Harbor. One crew member was narrating the tour and he was personable and interactive. It was interesting to hear about the history of the Island and see the celebrity mansions that line the shore. I love the casual “Island time” of the Bahamas and we enjoyed every second of this relaxing boat ride. After a short cruise along, dinner was announced and a small casual buffet on paper plates was ready in the galley. The BBQ ribs, chicken and traditional Bahamian style rice were our favorites. 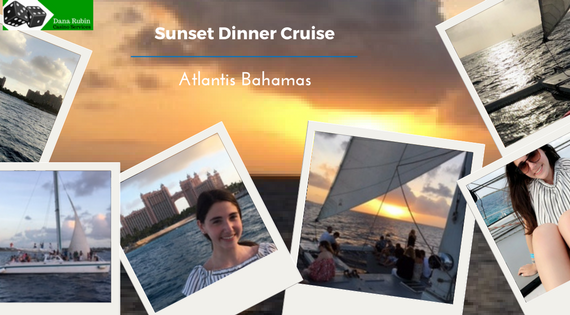 After dinner the sun starts to go down, sails go up and we cruised along at a fun clip to the middle of the ocean with breathtaking views of the entire Atlantis resort and the endless white sand beaches. This gorgeous scenery provided great picture taking opportunities and I saw several families taking group pictures with this amazing backdrop. You can tell these families were sharing a special moment and I was happy for them and I felt the love (yes, I know it sound corny)! Something about the ocean, sunset and the smiling families got to me and I wanted to make sure I shared this experience with others. The moment had come, the sun was setting and it was prettier than I had imagined! I didn’t want this excursion to end! Lovely boat ride back through the harbor and just as we realize the tour is coming to an end shortly – Surprise! – music is turned up and here comes a little bit of a party time! Dancing, music – we were loving it and I embarrassed my daughter by swaying along to the beat (fun pop music that my daughter said were her favorite songs on her playlist). I would have gotten up and danced along with the crew but I knew that my teenager would not talk to me the rest of the vacation if I did that so I held back! What an amazing night! This beautiful boat pulls effortlessly back on the dock, we exit like rock stars and the night was over. We walked across the street back to the Atlantis and both vowed to do it again next year! Bring a little cash to purchase drinks. Full bar, bottled water and soft drinks available but they are not included in your ticket. One Bahama mama or fruit juice is included but if you want more bring cash. 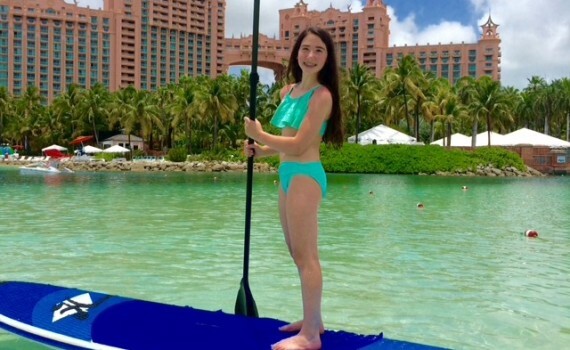 My 15 year old daughter and I decided we wanted to do something different and adventurous on our annual summer Atlantis, Bahamas vacation. We found an off property excursion, Powerboat Adventures, that was advertised as “the one day, one trip that will have you talking for years”, and it did not disappoint! 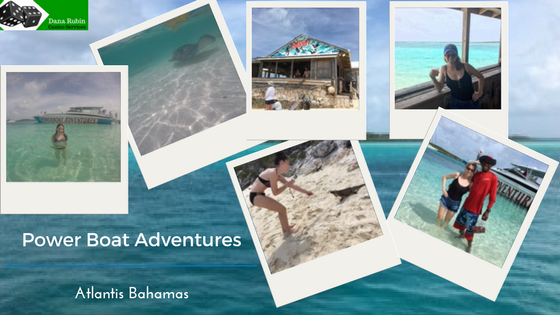 Powerboat Adventures is an all-inclusive day trip from Paradise Island to the secluded Exuma Cays (the real Bahamas out Islands) 38 miles away by ocean! We were picked up at 8:30 am from the Atlantis and brought to the Ferry terminal right across the street. We walked back to the Atlantis at the end of the day (5 pm) when the excursion was over. They have 2 powerboats – we were on the 60 foot, triple engine boat. Sleek and amazing, and we sat in the front for the 60 minute boat ride out to Exhuma Cay. It was a semi bumpy ride at times – not too crazy but fast, exciting, gorgeous and relaxing all at the same time. We rode in this cool jet drive boat on the amazing blue ocean with the sun shining on us and wind whipping through our hair. The first stop was to a little island called Allan’s Cay – home of the Iguana Dragon lizards. These iguanas (up to 3 feet long)! scamper out of the bushes and come close to you to eat grapes that you are feeding them from a stick. Totally cool – we were a little apprehensive at first but it was great fun and neat to see these “living dinosaurs”. The crew on Powerboat was amazing. They would take pictures for you whenever asked and were very lively. Back on the boat to the next stop: “Ships Channel Cay”. 007 James Bond music was pumping through the speakers on the fast boat ride over – I felt like I was in a Bond movie! Loved it! Ships Channel Cay is Powerboat Adventures’ own private island lagoon with calm waters, beautiful beach and an adorable cottage/deck. The colors of the lagoon are out of a dream – I have never seen so many different shades of blue and turquoise. The cottage was shaded and had a full bar that provided drinks all day. It was cool to be on your own private island. A fresh grilled lunch (steak, fish, salad, fruit, etc) and open bar ALL DAY were included on this excursion. Yummy Baha Mama’s were flowing! Note, several children were on the boat so it is a very family friendly excursion. The first activity was the STINGRAY FEEDING experience. The crew has the wild stingrays come up to you as you are lined up on the shore and you feed them fresh fish out of your hand! Again, could be a little nerve wracking at first but it was an experience. The stingrays brush up against you and it is intense! All of the encounters are in the wild, with no cages or pens. If you do not want to participate you have a first row view from either the shore or the shaded deck. Next activity is drift snorkeling (gear provided) – you should be comfortable swimmer for this part. After snorkeling comes a little relaxation, lunch, drinks and get ready for the main attraction – the world famous Shark Feeding Show! Featured often on the Travel Channel and Discovery Channel’s SHARK WEEK. The crew wrangles the sharks close to you by throwing bait to them on a rope and “wrangling them” in. It is really exciting to watch and surreal that these sharks are so close to you but still “in the wild”. It seems they do know when to come close to the shore daily for “feeding time”! Great entertainment like I had never experienced before and you might be one of the lucky ones who gets to “help” the crew wrangle a shark on the feeding rope. It was tons of fun but also adrenaline pumping as it was repeated to us several times to stay on the edge of the shore and not go into the water while the feeding was going on! This whole excursion was casual and not rushed – plenty of time to relax, chat with others from the excursion and really revel in the moment of being on this secluded deserted breathtaking island. The last formal activity was the Conch Salad Show. We watched as the crew created a fresh conch salad for all to enjoy. Fresh conch is pulled from the ocean, split opened, cleaned, mixed with limes and veggies and voila! Delicious! We were bummed that the day was over and would do this again in a heartbeat. Definitely a highlight of our trip – 5 stars! Sit in the front of the boat for a more “wild” ride and the back of the boat for a calmer, smoother ride. We sat in the front on the way out and the back on the way home (back is shaded and undercover so this was perfect for the end of the day). The epicenter of the Atlantis resort is Marina Village. It is the place to walk around for shopping, dining and free nightly entertainment. 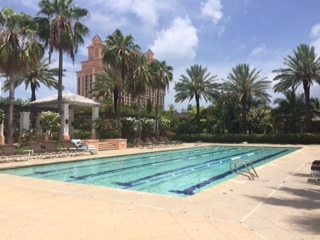 The Marina Village is located at the Atlantis (everything is located right there and I keep mentioning this because this is what makes Atlantis such an easy and relaxing vacation – you never have to leave the resort)! While walking through the Marina you are looking at all the huge yachts – which is just beautiful. 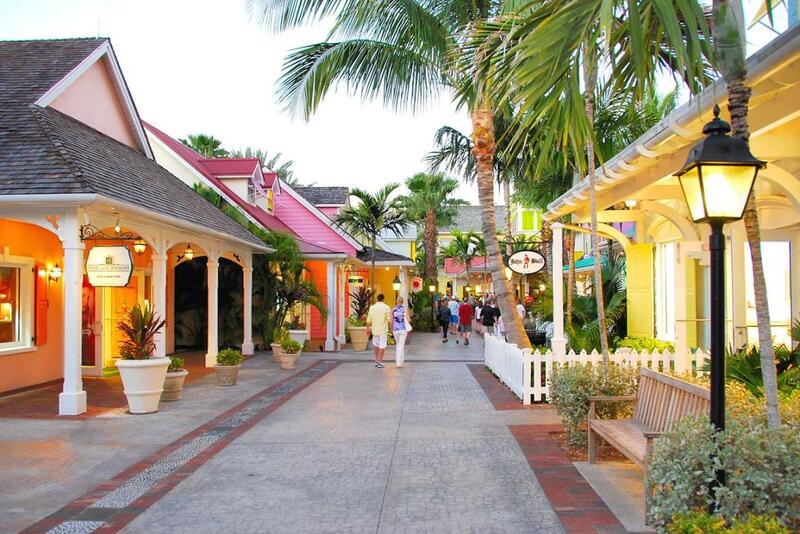 There are 20 cute shops in the Marina to peruse as well as a Ben and Jerry’s, Starbucks, adorable candy store and several casual restaurants (Carmine’s, Johnny Rockets, Quiznos, Bimini Road). We also love the Daiquiri stand that offers both Virgin and regular frozen Daiquiris. Fun to grab one after dinner and walk around the Marina Village. Our favorite restaurant in the Marina is Bimini Road. It is a cool indoor restaurant with an outdoor bar. The lobster is amazing! The best part is the live music they have playing on the outside deck at night. We loved the Bahamian group singing Journey “Don’t stop believin’” and other 80’s hits. The singers are interactive and lively– more free entertainment to take advantage of at the Atlantis. There are also steel drum bands, a stilt walker and more throughout the Marina Village. Get to Bimini Road early for dinner. They don’t take reservations and it is a very popular place! 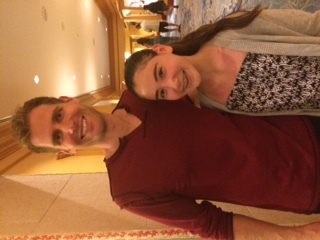 A huge highlight of our trip was the amazing new Magic Show at the Atlantis. We saved this show for our last night. 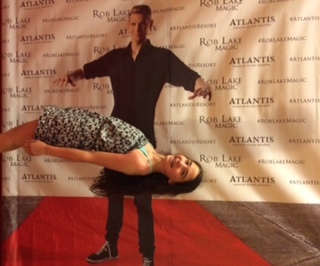 This summer the Atlantis featured The Magic of Rob Lake, performing in the Atlantis Theater Wednesdays through Sundays at 8 pm. I am hoping they bring him back again this summer! Run, do not walk to get tickets to this family show! (Tickets are ordered at the box office in the Beach tower). I send a ton of business to Las Vegas as well as the Atlantis so I have seen every show imaginable and this is hands down one of the best! 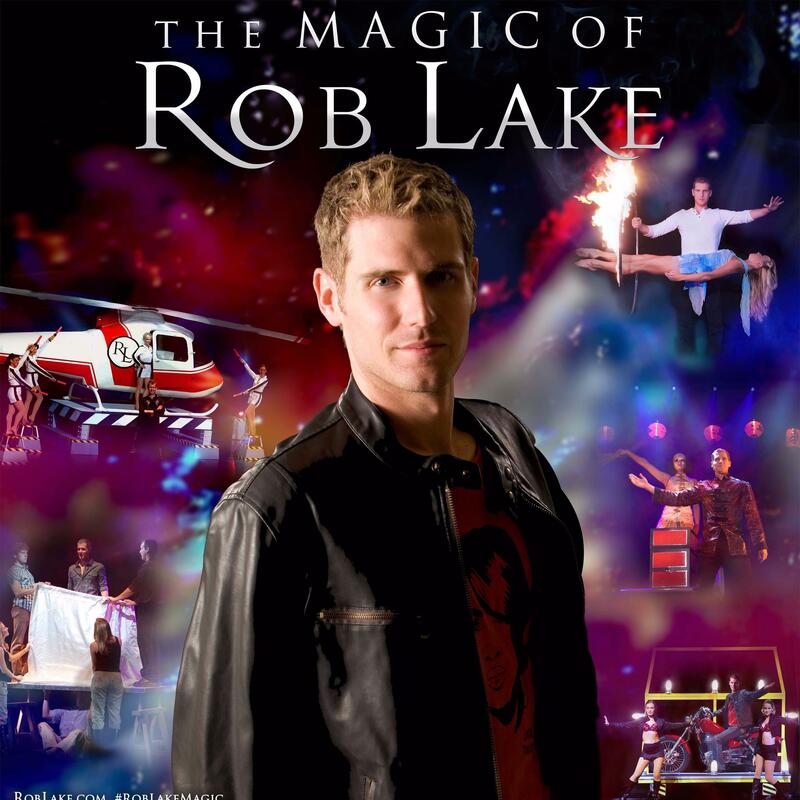 In researching Rob Lake online I now see he won International Magician of the year and has performed his grand illusions all over the world. This is a first class show and truthfully I felt it was an incredible bargain. This entire show is fantastic! My family was in awe and we loved every second of it! We also could not believe the amazing value. An adult ticket is $44.00 and kids are $10. They sell popcorn and concessions in the theater before the show. The audience participation was huge for both kids and adults. Stick around after the show to get an autograph and take a picture with Rob Lake – My daughter and I were definitely star struck. I was happy to have the opportunity to tell Rob in person that his show was amazing and I was planning on recommending it to all of my customers. 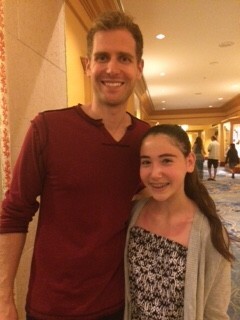 He was humble, thankful and adorable – loved it! 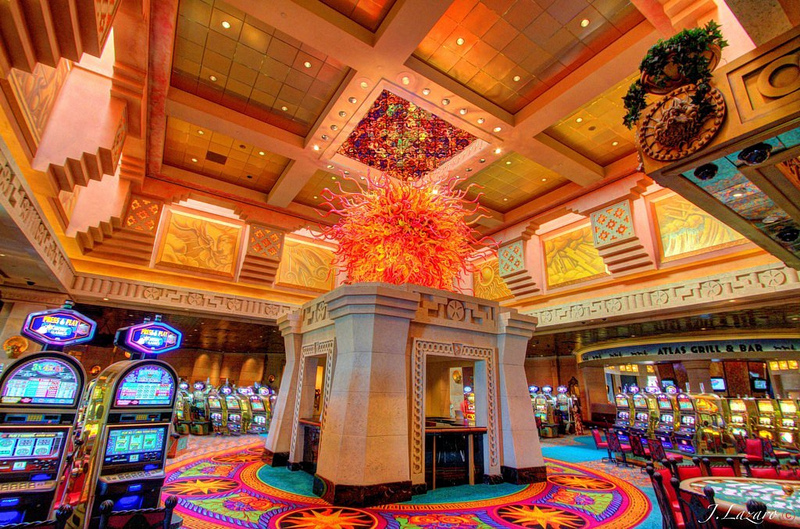 Gambling age in the Bahamas is 18 years old and table games are open daily from 10am to 4am. My husband spent a few hours in the casino most nights and said the dealers were fun and friendly (and of course drinks in the casino are always free). There are 750 of the newest slot machines and each slot machine is equipped with the latest in ticket/ ticket-out technology and state of the art rating system. Your room key doubles as your players card and you can earn comps on your gambling action that can be redeemed at the end of your stay. Daily slot tournaments are offered in the mornings and everyone is a winner (prizes range from $10.00 in free slot play to $100 in free slot play). The casino also offers free gaming lessons twice daily. I have been a casino marketing representative for 25 years and I always say, do not play a dime without presenting your players card at the table. If you get your casino play rated you will be on their loyalty list and eligible to receive future room promos and offers. Do not gamble without showing your card! My husband used the fitness center often and we both were impressed with the quality of the machines and equipment. All treadmills have a built in TV. State of the art – clean and convenient. 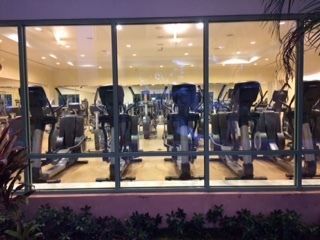 The fitness center fee is included in your resort fee. There is also a lap pool right outside the fitness area as well as a Pilates and yoga studio (extra charge for these classes). There is also tennis courts and a full size basketball court that Michael Jordan hosts tournaments on every year. There is a cool rock climbing wall also as well as a big Shuffleboard game near the beach. 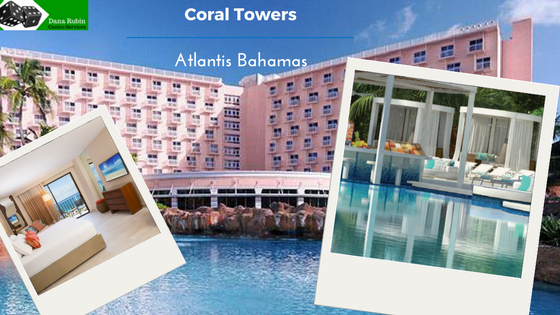 Every which way you turn at the Atlantis you discover something new.